A totally gripping psychological thriller that will keep you reading until the very last jaw-dropping twist. “The Willis Curse; The Cursed Family; The Mysterious Willis Family.” Expressions like this followed Charley Willis around ever since the brutal murder of her celebrity parents when she was thirteen years old. Charley had hidden away from such awful terms, as well as horrendous memories, for years. However, on her wedding day to Seth Chambers, she suddenly disappears. Quite naturally, the police and the media are desperately seeking answers. But no one more-so than Seth. The question boils down to this: Did Charley leave of her own accord or was she taken? 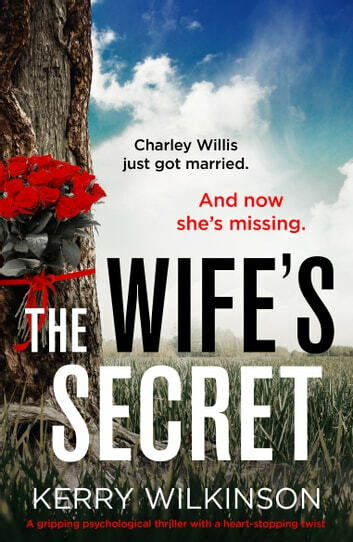 The Wife’s Secret is told from Seth’s point of view in the present, as well as Charley’s story, from her younger years to the time of her disappearance. As insightful as the flashbacks into Charley’s life are, the twists and turns are ultimately quite shocking. There is a tremendous amount of family drama revealed in this story. As the description clearly indicates, Seth is about to discover that he really didn’t know the woman he just married. They had a quickly evolving relationship, but Charley kept the deep, dark secrets of her past from Seth. What if Seth had pushed Charley, would things have turned out any differently? While the intrigue was quite sharp during this story, it was problematic at times. As a reader, I was far more interested in whether or not Charley would be found than the flashbacks. However, things did pick up. When they did, things began to click into place. While it became evident to me early on regarding the truth of the tragedy Charley experienced, I was definitely able to remain engaged. One strong pull to this story was the family drama and relationships. I most assuredly was eager to know of what possible resolution could be had. For such a great story, I was a bit sore about the conclusion. Although Kerry Wilkinson is new to me, he certainly is not new to the genre, having written dozens of quite successful books. There is no doubt of his accomplishments, as he certainly penned quite a riveting story here. I am eager to read more of his titles. Many thanks to Bookouture and to NetGalley for this ARC to review in exchange for my honest opinion. Loved this book. You can't put it down just have to know what's going to happens every time you get to a bit you think you can stop something else keeps you gripped, I have read most of Kerry Wilkinsons books, but the stand alone thrillers are not to be missed . Would give more stars if possible great read. A mystery with a few well placed twists. Kerry is very good at exploring the human mind and distorting things. They all make up a very good psychological thriller. The book was captivating, but I wish there was an epilogue to say how Seth and Charley went on with their lives.